On September 26, 2019, The Global Institute of Forensic Research will be facilitating a remote access training on the WAVR-21 V3 with developers, Drs. Stephen G. White and J. Reid Meloy. The live and interactive workshop will provide attendees with initial training and demonstration exercises on the use of the WAVR-21 V3. 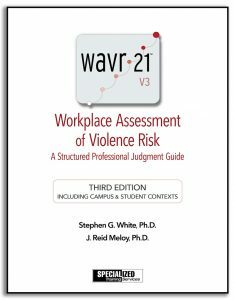 This is an introductory course that also covers the development and utility of the Workplace Assessment of Violence Risk-21, Version 3 (WAVR-21 V3) and is recommended for all users. 6 hours of Continuing Education Credit are available. to maximize their continuing learning and growth. Have you had training from experts, including perhaps from us? Have you attended conferences and bench-marked with other threat assessment practitioners and organizations? What’s next? Consider a private workshop in which your threat assessment team prepares your own case presentations and then engages with us in a technical debriefing. The best lessons and insights for you and your team ultimately come from your own case experience. If you include outside threat assessment experts to consult on cases, you hopefully learn even more from their perspective and contribution. We have practiced post-case debriefs for years and are increasingly recommending it. The cases may still be active, but are more often considered resolved or inactive. Among its advantages, this format illuminates the nuances in assessment strategies and case management that are particular to an individual organization, its culture and its inhouse practitioners. We can personalize teaching points and go beyond what is accomplished in general threat assessment workshops or public trainings. Discussing your own cases also provides a great way to improve assessment skills using the WAVR-21 V3. The workshops are usually a full day and may include up to five or more cases that the team has prepared. In-depth discussion typically identifies obstacles and opportunities at various levels and how an organization’s threat management program and protocol may be improved. Threat assessment consists of general principles, but threat scenarios present a wide variety of individual differences – in subjects of concern, targets and their expectations, and work environments and topography – calling for flexibility in response and selected interventions. Threat assessment teams in organizational settings ideally meet regularly to discuss new and ongoing cases. But they rarely get an opportunity for a “retreat” with an expert to delve more deeply into their more challenging cases and the inherent “lessons learned” opportunities such exercises offer. The critiques and discussions are conducted respectfully, as we offer teaching points and raise questions for attendees’ consideration. Threat assessment lives on information and collaboration. Attendees often come to recognize how collecting more reasonably available information leads to better-informed case management decisions. As an alternative to in-person workshops, webinars can be arranged, and are especially effective if scheduled periodically. We emphasize that the advanced case debriefing workshops are best suited for existing teams that have had some basic training in threat assessment and have some demonstrated experience working together. For further information and pricing please contact Dr. Stephen White: swhite@wtsglobal.com. As many of you may know, this bill in the House of Representatives (HR 6664) is slowly moving forward, and outlines the beginning of a national strategy for threat assessment and management as a standard of practice. The bill is supported by many bipartisan sponsors in the House. Your organization can help by formally endorsing this bill with a public letter of support. With organizational endorsements from institutions of higher learning, corporations, and other entities, the bill can become law. The bill will direct a DHS Task Force to recommend a national strategy for preventing targeted violence through threat assessment and management, with grants then being awarded to establish community-based units for implementing the national strategy. Dr. Reid Meloy has been very involved in assisting with the legislation. If you or your organization are interested in helping with a letter of endorsement, please contact Reid (reidmeloy@gmail.com), and he can fill you in on the relatively simple next steps. Make no mistake, this is truly a much-needed and long-awaited step forward. The legislation is informed – it reflects an understanding of targeted violence dynamics and thus meaningful and practical ways to prevent it at all levels of awareness and intervention. You can show your stakeholders what the bill is about with this YouTube video by its author, Congressman Brian Babin: click here to view video.